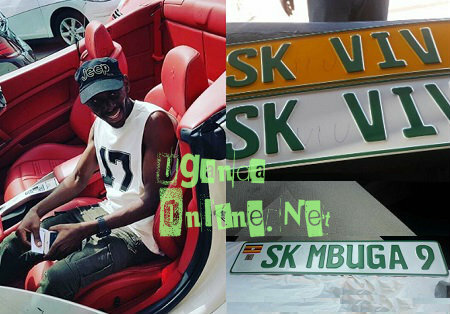 An SK Mbuga fake Facebook page was opened two weeks back and since then, it has close to 50,000 likes of those looking at getting a free posh car. On October 31, the impostor put a pic of SK Mbuga three rides that included a Ferrari, Rolls Royce and Range Rover Sport, that pic was taken last year as they were preparing for the SK Mbuga 5billion wedding that was. "Like this page, share it with your friends, I'm going to give out one of my cars to one lucky person and you know me, when I promise I fulfill." That post got the numbers of people liking the page increasing by the minute. It had 9,243 shares and 8,740 likes. It should be recalled that Bryan White has stolen the limelight from all these socialites by giving out money, so the imposter behind the SK Mbuga fake page had a well calculated move of "giving out" one of the posh Mbuga rides that could silence the new socialite, the move worked. Not long back. Mbuga gave a Mercedes ML 350 to the guy who was taking care of him after the bike accident, so the imposter using the issue of giving out one ride that belongs to Mbuga was a move that would certainly attract a huge following. SK Mbuga using his authentic Facebook account recorded himself on video while warning all those who were participating in the fake game to stop it hencewith as he was not behind that account, but up to now, the number of those expressing interest in the free Mbuga car bonanza is still growing, though at a decreased rate following the warning. Mbuga has only posh rides ranging from Hummers, Mercs, Jeep Cherokee, Brabus and now super cars that include a Rolls Royce, Ferrari and just recently a black interior Lamborghini Aventador, so the guys were looking forward to owning one of those posh rides. The last post the impostor put was when SK Mbuga was giving out a dummy check to Miss Uganda. You may recall that at the previous Miss Uganda pageant, SK Mbuga gave out Shs 3Million to Miss Uganda who also doubled as the Ambassador of SK Mbuga Foundation, when those following the fake page saw this, they continued liking and sharing the page which was the condition for winning the car. They also kept on showering the imposter with praises that could boost their bid to win the car in question. Meanwhile, it turned out that Bryan White paid SK Mbuga a visit some time back at his home, their pic was trending the whole of yesterday.